As interest in the Panama Canal Expansion seems to be growing beyond ports and congressional committees into the worlds of transit planners and urban designers, it has become obvious that there are more questions than available answers. The potential impact the Panama Canal Expansion may have on communities throughout the country is startling; it is a true game changer for the ports and cargo-related industry and will surely take some time to manifest. My goal here is simply to introduce the project and present some of the key issues that planners and designers will face in the future. Since 1914 the Panama Canal has been a reliable short-cut between the Atlantic and Pacific oceans, providing a quick and relatively easy trade route for the US and the rest of the world. Today, however, it operates at or near capacity of about 35 ships per day. The Panama Canal Expansion is not the largest infrastructure project currently underway, but it absolutely has the most global influence of any project today. To meet new capacity needs and larger vessels, the expansion includes adding a third set of locks, dredging a deeper channel and implementing several measures to improve water quality and usage. These improvements will allow double the number of goods to move through the Canal annually, as well as modernize the Canal to handle some of the world’s largest and most sophisticated tankers and vessels. Opening the Canal, which is slated for 2015 at a cost of $5.25 billion, will forever alter global trade patterns. Post-Panamax – How big is big? Vessel classification can be complex and confusing, particularly when standards vary according to factors such as country of origin, insurance coverage or trade routes. Generally, cargo ships are categorized by size and capacity and are closely related to the dimensions of the canals through which they travel. For example, the terms “Panamax” and “New Panamax” refer to the largest ships that can fit through either the original locks or the new, expanded, Canal locks, respectively. The original Panama Canal locks measure 1050 ft. x 110 ft x 41.2 ft (depth) and currently accommodate a Panamax vessel. The new construction of a third set of locks (one on each, the Pacific and Atlantic sides) will be equipped to handle the larger, New Panamax (often called Post-Panamax) ships measuring 1400 ft. x 180 ft. x 60 ft.
Container traffic is measured in twenty-foot equivalent units (TEUs) and is, used to describe the capacity of container ships. Panamax ships typically carry 3,000-4,500 TEUs of cargo. The expanded Canal is designed to accommodate 12,000 TEU ships – more than twice the previous capacity; and the New Panamax vessels are expected to carry around 4,500-8,000 TEUs. The newest generation of container ships can handle up to 18,000 TEUs but have limited routes–usually between Asia and Europe. 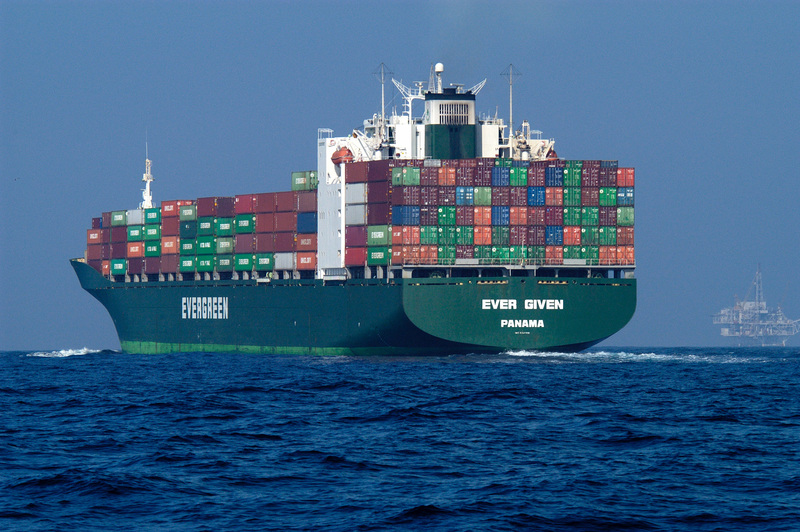 New designs describe even larger ships, expected to carry 27,000-30,000 TEUs. Their construction is limited only by a propeller large enough to power them. Around 70 percent of all the cargo being shipped through the Canal is either destined to or coming from the United States. Research conducted by staff at the Institute for Water Resources (IWR) examines some of the economic implications of the Canal expansion to US Ports and finds that during peak demand, “It is not uncommon for vessels to wait ten days before transiting the canal. It can cost shippers as much as $50,000 per day to wait in line” for a 51-mile journey that takes approximately half a day to complete. Demand for timely access to the Canal has even led to bidding for prime spaces in line – commanding upwards of $200,000, not including transit fees. Time is money in the shipping industry, and this creates real incentive for companies to reach port quickly with the maximum amount of cargo possible. More than 40 percent of containerized imports enter the US through California. The Golden State is home to the most important multimodal trade gateway in the country, the San Pedro Bay Port Complex, comprised of the Ports of Los Angeles and Long Beach. This gateway complex contributes more than $400 billion in trade to the US economy and more than $10 billion in state and local tax revenues per year. More than three million jobs across the country are linked to California’s public ports, according to the Pacific Merchant Shipping Association, and California is by far capturing the majority of import and export shipping business through the Panama Canal. However, that will likely change with the Canal’s expansion. The New Panamax ships will soon be able to bypass California and go directly to any US port having the capacity to serve them, effectively redistributing the market share. According to a white paper produced by Colliers International, a port is considered post-Panamax ready when it has met three key criteria: 1) a channel depth of 50 feet with sufficient width and turning basin size, 2) cranes capable of loading and unloading post-Panamax ships, and 3) docks engineered to handle the larger cranes. East and Gulf Coast ports are scrambling to prepare their port facilities while many inland states and local governments are faced with critical intermodal infrastructure improvements. Important supply chain links such as rail lines, bridges, tunnels, inland lock and dam facilities also need to be upgraded and expanded to keep the increased number of goods moving across America. Many ports and local governments are using a combination of public and private funding sources to pay for unanticipated Canal-related infrastructure upgrades. For example, the Port Authority of New York/New Jersey must elevate the Bayonne Bridge at a cost of more than $1 billion to allow larger ships to pass. In a commissioned report released in September 2012, the American Society of Civil Engineers (ASCE) estimated that America needs to invest around $30 billion to repair key structures, yet the current approved budget is closer to $14 billion. Widening the canal is undoubtedly a significant engineering and logistical achievement, an amazing demonstration of construction technology that modernizes shipping and trade for ports around the world. The Canal Project directly impacts planners working in areas of transportation, development, housing, public space, policy, health and environment just to name a few. It shakes up an already dynamic and complicated industry leaving mostly speculation and educated guesswork to help develop growth strategies. The US can upgrade all of its ports, but there is no guarantee how– or even if– they will be used. It is critical that planners working in urban and emerging port centers become knowledgeable of the new Canal and understand the implications it may have on development and settlement patterns over the coming decades. Globalization and pressure from other passages present planners with more unanswered questions. The US is most affected by the Panama Canal Expansion but Caribbean ports will also feel the effects of the changing industry. Shipping companies may find increased potential in the hub and spoke distribution model as the smaller, Panamax ships can remain in service as a flexible alternative to filling large post-Panamax ships. Considering that supply chains value choice, stability and quick turnaround, Caribbean ports could deliver those using a stronger network of hubs, particularly if the East Coast is unable to distribute goods because of a failing or inadequate infrastructure. There are any number of new routes that shipping companies may devise to maximize their efficiency and return on investment, it is just too soon to tell what those may be. It is safe to say, however, that fuel costs will continue to affect shipping and environmental regulations, impacting an industry still almost completely reliant on fossil fuels. While efforts have been made to produce cleaner burning fuels, such alternatives can cost nearly double that of the more commonly used diesel fuels. Overheated port competition, labor strikes, a slowing Gross Domestic Product and State budget crises all could negatively impact or interfere with trade activity. While these issues are not new, the risk is greater simply because there is more at stake – more competition, more trade volume, and more jobs. In July 2012, the Obama Administration announced the establishment of a White House-led Task Force to develop a Federal strategy and coordinated decision making principles focusing on the economic return of investments to coastal ports and related infrastructure. Part of the We Can’t Wait initiative, these port projects are seen by the Administration as a way to help drive job growth and strengthen the economy. At state and local levels, government agencies are taking steps to improve their competitiveness and build on their existing assets. For example, the state of Texas convened a working group whose members represent Union Pacific, BNSF, the Texas Farm Bureau, Texas Motor Transportation Association, Texas Oil and Gas, Texas Ports and the Economic Development Council among others. Their goal was to provide the State Department of Transportation with a better understanding of potential opportunities and recommendations on the infrastructure needed to best take advantage of those opportunities. Investments are pouring in at state and local levels in order for ports to berth larger vessels and be completely operational by the time the Canal opens. In almost all cases, significant investment is required for port and intermodal transit systems representing major competition among US ports for congressional funding. In an effort to streamline the permitting and construction of environmental reviews and port upgrades in California, the Jobs1st Alliance brings together politicians, economists and unions in a campaign to highlight the seriousness of inaction. Comparing the potential job losses at Southern California ports to the demise of the States’ Aerospace industry in the 1980’s, a video posted on YouTube.com paints a rather grim picture for the area if projects do not move more quickly keeping the area attractive to industry customers. The White House also announced the first seven of forty-three nationally significant infrastructure projects to be expedited as part of the We Can’t Wait initiative. Five ports, including Jacksonville, Miami, Savannah, New York/New Jersey and Charleston, will move forward with important infrastructure projects. The remaining projects are expected to be named over time. The West coast ports’ Green ports policy may provide a key competitive edge. According to an article published by online journal Environmental Health Perspectives, ships burn a high sulfur by-product of traditional fuel-oil refining and are large contributors to air pollution, particularly in port communities. An increasing number of reports describe environmental and public health impacts associated with ports and the shipping industry. Cargo shipping is notorious for polluting air, water and indigenous aquatic species, and intermodal transit associated with cargo delivery adds to environmental and health impacts related to the shipping industry. While there are strong efforts by ports to improve the environmental conditions associated with shipping, it may not be enough if one considers that the Panama Canal project anticipates doubling the amount of cargo in US ports. However, as ports examine their individual strengths and propose to build on them in an effort to remain competitive, there is hope for significant environmental progress. BNSF, for example, has recently invested in redesigning its terminals at the Port of Los Angeles. Such design changes reduce the distance trucks must travel to transfer cargo, thus reducing truck emissions and improving the overall air quality. Los Angeles and Long Beach agree that Green Ports are one of the key assets they plan to enhance to attract and keep business. The Panama Canal Expansion is expected to open in 2015, after which, more information and clarity will emerge regarding trade routes and cargo shipping. Until then, planners should analyze the exciting opportunities that this project presents from an international level right down to the local railroad crossing. We will surely have more questions, but at least we’ll better understand the issues and, more importantly, how our unique set of professional skills can resolve vast, global challenges.